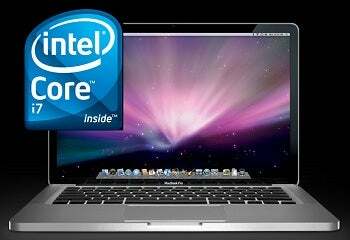 Rumor: Core i7 Coming Soon to MacBook Pro? Will Apple's New MacBook Pros Offer 3G Wireless? The timing of the rumor coincides with the opening of Macworld Expo, though Apple will be a no-show at this year's show. Nowhere Else claims that an insider at Apple has confirmed the existence of the new laptops. Meanwhile, a recent benchmark test spotted on the Geekbench Web site is fueling more speculation. The benchmark in question lists a system that identifies itself as a MacBookPro 6,1, a currently unused model identifier. The Geekbench listing for the mysterious '6,1' system details that the it has a 2.66GHz Core i7 processor, and runs an unreleased build of Mas OS X (10.6.2 Build 10C3067; the current release is 10.6.2 build 10C540). Current MacBook Pros carry 5,x identifiers, and are built around the Core 2 Duo processor. In past years, Apple has used Macworld Expo to launch a number of high-profile products, including iTunes, Safari, the Macbook Air, and the iPhone. But with no keynote planned and a media event having taken place only two weeks ago, any product announcement would likely be a quiet one. The anonymous insider tip-off seems unlikely, and Nowhere else has a spotty track record when it comes to rumor accuracy, but other recent rumors, the mystery benchmark report, and the fact that it's been several months since the last MacBook Pro update, do swing things in the report's favor. In either case, watch this space.